The main incentives of the following project are to conserve the globally significant habitat and its species, sort out conflicts between people and park, improve park management planning and park operations. Moreover, increase the neighboring community’s participation in protected area organization. To conserve Pakistanâ€™s inimitable habitats and wildlife, WWF and its associates are working with local establishment in a number of protected areas throughout the country.Â This comprises of conservation projects in the Hingol National Park on the Makran coast in Balochistan, home to a significant diversity of bird and fish species as well as leopard and ibex; Chitral Gol National Park near the Afghanistan border, known for its Markhor goats; and Machiara National Park, one of the few sites in which one finds a breeding population of the western tragopan pheasant. Hingol National Park lies on the Makran coast in Balochistan approximately 190km from Karachi. The park area contains a variety of topographical features and vegetation, varying from arid sub tropical forest in the north, to arid montane regions in the west. Large tracts of the park are covered with drift sand and can be classified as coastal semi desert. It includes the estuary of the Hingol river which supports a significant diversity of bird and fish species. Chitral Gol is a narrow valley, its gorge running for some 18km before broadening out into a basin surrounded by high peaks. Numerous tributaries drain into the Chitral Gol, which flows southwards into the Kunar River. 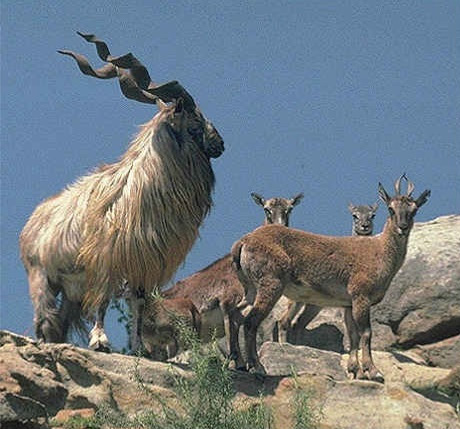 The park is famous for its Markhor goats. Machiara National Park consists of montane mixed broadleaf-coniferous forest and contains a significant number of bird species.